ELV is ashamed of himself. Not really, but it sounded like a good opening line. We are a little remiss in posting our tasty snaps of Social H0use — having eaten there over two months ago — so we apologize for withholding them from you for so long. Truth be told, we were a little hesitant to accept Manager Michael LaPorte’s invitation to swing by…having always found the offerings of Social House-Treasure Island to be as pedestrian and mind-numbingly boring as whatever stupid pirate/stripper show was/is running out in front of that joint. But it seems with the move to classier digs at Crystals Mall, Chef Joe Elevado has…how do we say this?…elevated his game to where his food now matches his super-cool surroundings. Everything seems to have more snap and refinement to it, and dishes like his salmon with wasabi creme fraiche, lemon soy, and crispy shallots will have you swooning. Ditto his yellowtail with crispy jalapeno and calamansi (Philippine orange) soy — straight from the Nobu playbook (where Elevado, as a sous chef, first elicited these elaborate elements). As compelling as the raw fish is, it was the “Social House Hot Dishes” where the kitchen really seemed to shine. Wagyu beef gets just the right accents from garlic-oil or spicy ponzu, demonstrating both Elevado’s deft touch with meat and the proper way to set off the richness of this fabulously fatty steak. The only piece of fusion confusion we encountered was in the combining of miso-glazed cod with foie gras in lettuce cups. Some people (including The Food Gal®) might enjoy this ultimate blend of surf with turf…but the textures were too mushy and moist for us, and the payoff not worth the tariff ($27). Every other combination, bite, ingredient, plate, accent, and seasoning was a winner, however, and signaled to us Social House’s seriousness as a sedulous, savory, sashimi/sushi server. No matter what else you order, don’t leave without trying the “Crispy Pata” — a crackling pork shank with house made pickles ($24) — served with a side of garlic/chile vinegar that’s just the thing to cut through all that piggy perfection. It may be the best pork dish in all of Vegas and might single-handedly elevate (yes, that’s twice in the same post) Elevado to the pantheon of porcine impeccability. Congrats* to Social House and its team for today’s article in the New York Times. Between their food and their sake program, and getting such major props from the national foodie newspaper, expect this place to be slammed for a while. And it deserves to be. 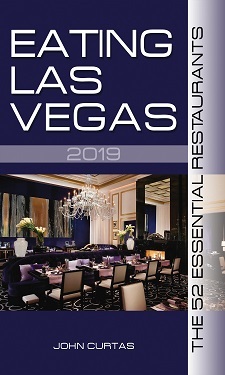 * As long as we’re heaping praise (and now feel good about giving Social House its due), we thought we’d mention that this post marks a milestone of sorts for Eating Las Vegas. The tasty snaps above are the 1000th photo spread we’ve posted since starting this website in 2008, and our staff informed us yesterday that January, 2011 marks the first month we’ve gotten over 100,000 page views in a month. Generally, we hate self-congratulatory bloggers (Hooray ME! See how everyone is paying attention to ME?!) and you know who you are…but this one time, we couldn’t resist patting ourselves on the back. ELV promises it won’t happen again unless Barack Obama becomes one of our regular readers and starts posting comments. This food is look so yummy. Which is shown in your post.